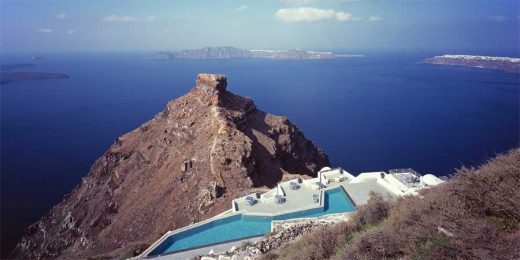 How could one revive vernacular architecture in such an exceptional setting as Imerovigli, Santorini, with its view of the Caldera, opposite the Skaros rock? 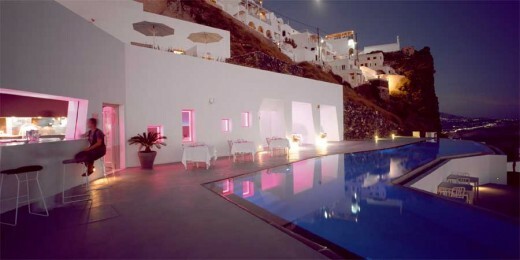 Generally rooms to rent at the Caldera simulate the vernacular by cloning indefinitely vaulted roofs. 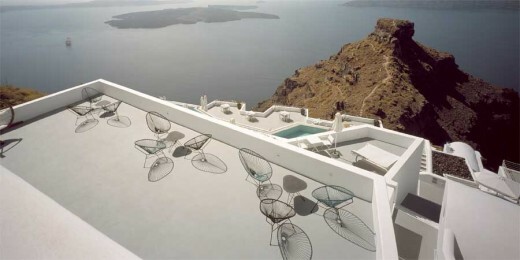 However at Grace Santorini, no vaults are used: the layout of rooms follow in plan the broken geometries of the ground’s contours, forming in effect a series of new stone ledges into the steep gradient of the Caldera. These jagged lines converge mid-slope, at the level which produces the greatest possible width within the site. 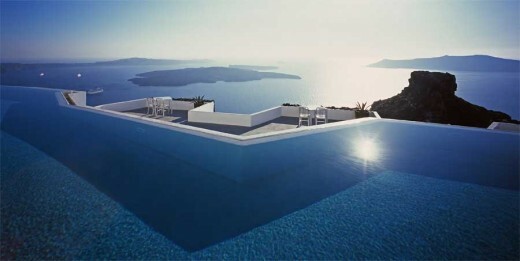 It is at this level that the pool, the restaurant and the bar of the hotel are situated. 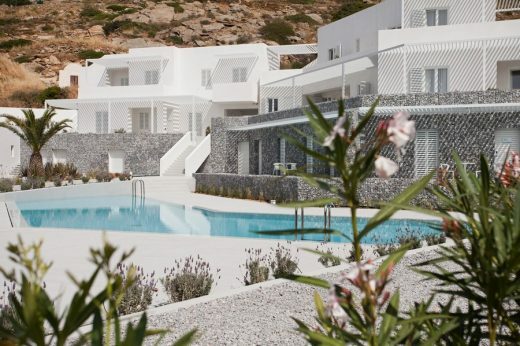 On the exterior of the hotel, stone walls create a rhythm of black and white: Some of the new rooms have acquired for their elevation a face of the region’s recognisable volcanic rock with gaps from which rays of light are allowed to pass. Since rooms are typically front loaded and fully open to the view, this reinterpretation of the vernacular stone walls ensures ventilation and privacy from passers-by. In these rooms, the recesses of the elevation form small private open spaces for contemplating the view. 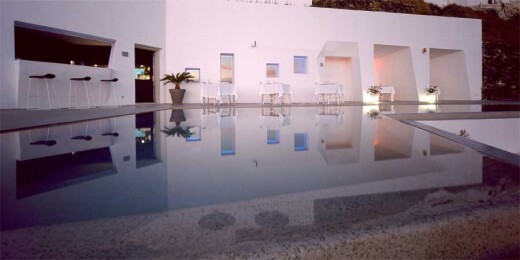 Being in these rooms you are not just surrounded by the usual Cycladic plastered white interior but you also perceive the volcanic rock façade, a potent reminder of the particular island you are located. Thick walls, another element of Santorini’s historic towers and fortresses, are introduced as a wall thickness that accommodates several built-in furnishings such as wardrobes and vanity units. 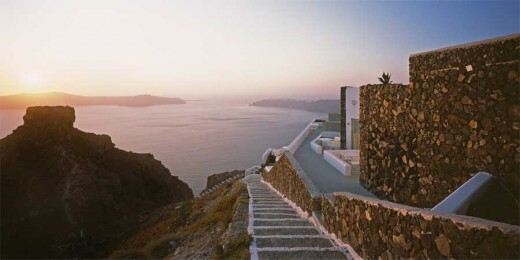 The concrete floors of the rooms retain the earthy palette of colours –together with the black and red stones in the walls they form a dialogue with the island’s unique geological section as exposed on the Caldera. 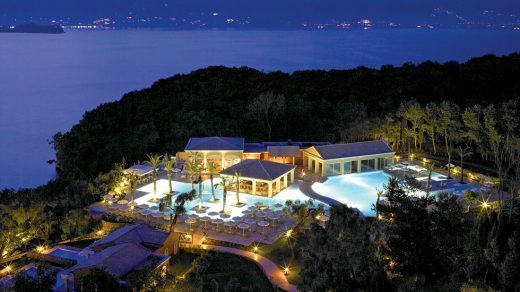 The idea of a black cavernous space equivalent to the special geology of the island has been maintained in the interior not only of the reception but also in the restaurant and the bar: on the background of the reception desk a stone wall has been built from black volcanic stones with remarkable voids, resembling the ones applied to rooms of the hotel. The background of the restaurant and bar area is painted in the dark colour of the volcanic stones and its prismatic geometry resembles a rocky landscape. This background embraces the long seating bench behind the tables, the facade of the show kitchen window as well as the wine rack. The wine rack is metallic and equipped with rows of circular holes for the horizontal placement of the bottles, holes that on an abstract level resemble the gaps between the black volcanic stones -red lighting behind simulate the warmth of Santorini’s volcano. The choice of exposed (unpainted) metal in proximity to the dark grey of the surrounding walls relates to the basic palette of the stratified Caldera section where black and mellow greys complement warm brown tones.